To develop, enhance and maintain a national flash-flood-scale basin dataset in support of the NWS Flash Flood Monitoring and Prediction (FFMP) system, and to provide technical assistance for dataset customization efforts at local Weather Forecast Offices. The National Basin Delineation Project was undertaken to centralize the consistent definition of flash-flood-scale basins for the conterminous U.S., Puerto Rico, and Guam. FFMP basin datasets consisting of synthetic streams, basin boundaries, radar bin center points, and other reference data were assembled for 143 WSR-88D coverage areas and delivered to 115 Weather Forecast Offices. This project involves the delineation of flash-flood-scale basins for use in the NWS FFMP system. Implemented in the Advanced Weather Interactive Processing System (AWIPS), FFMP is used to assist in flash flood warning decisions at 121 Weather Forecast Offices (WFOs) throughout the country. FFMP is based on the Areal Mean Basin Estimated Rainfall (AMBER) Program developed by Bob Davis and Paul Jendrowski. It computes basin average precipitation rates and accumulations from the WSR-88D Digital Hybrid Scan Reflectivity product, and updates these values with each volume scan of the radar. The accumulations are then compared to NWS Flash Flood Guidance (FFG) values or to user-defined threshold values to determine flash flooding potential. The basin delineation was performed using ESRI's ArcView and ARC/INFO geographic information system (GIS) software, and was based on the National Elevation Dataset (NED). Produced at the EROS Data Center (EDC), the NED is a seamless mosaic of the highest-resolution, best-quality elevation data for the United States. It was available for use in this project through a Memorandum of Agreement (MOA) with the EDC. Delineated basins were assigned unique IDs using the Pfafstetter system of basin codification (Verdin, 1997 ). This system defines basins according to the natural topographic control of drainage and the topology of the river network. Hydrologic ordering and relationships can be easily extracted from the Pfafstetter IDs, adding versatility to the basin dataset. The hydrologic connectivity attributes enable the use of the shapefiles with the ArcView Basin Customization Extension . The Basin Customization Extension contains helpful tools for editing and customizing the FFMP basin and stream shapefiles. 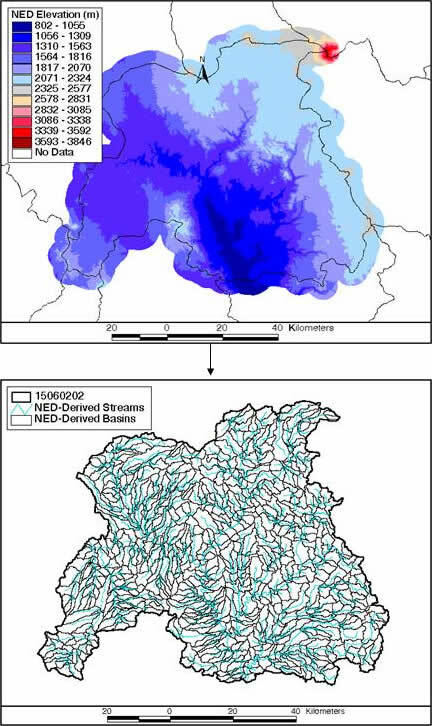 In addition, the extension's tools for tracing downstream flow paths and defining upstream drainage help dataset users to better understand the hydrologic network. Questons and comments about the National Basin Delineation Project may be directed to Ami Arthur.